Here the sun has been down for an hour or more and there is only residual purple light up in the stormy clouds above. 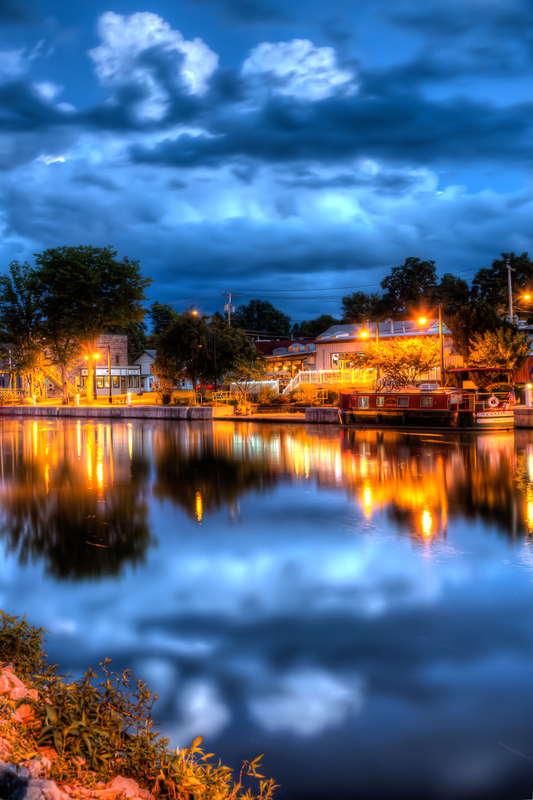 The ground is lit by an odd yellow artificial light of the lamps along the Erie Canal Pathway in Brockport. A packet boat rests at the docks of the Welcome Center. I went walking down on the Erie Canal in Brockport and it is nearing the end of the season. Only a few boats are coming through as it is getting chilly out and the kids are back in school. Also, in November they will drain the Erie Canal again. 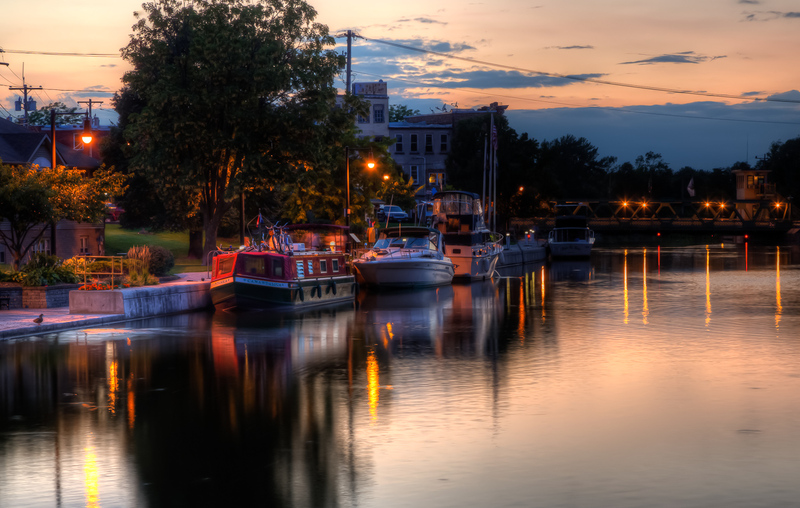 This photo is taken well after sunset when the lights are and people are settling down into their canal packet boats, cabin cruisers and sailboats. 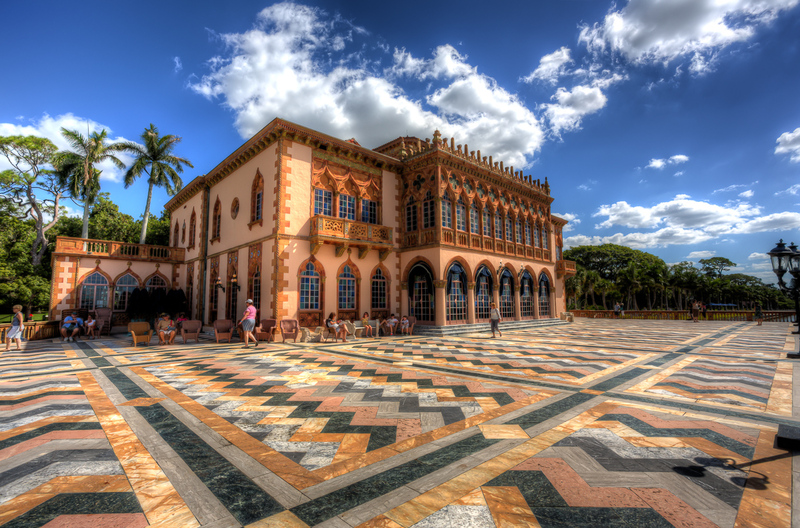 This is a view of the Ringling Mansion, Ca’ d’Zan, at the Ringling Bros Museum in Sarasota, Florida. I was way out at the far end of the patio overlooking Sarasota Bay but looking back at the mansion. I am amazed at the multicolored tile theme that runs throughout the entire place. The herringbone pattern is done in yellow, pink, grey and black stone. This is taken up in the windows which all have panes done in similar colors and even the roof tiles that you cannot see unless you are on the roof or 5th floor tower, have alternate colors to match. Can you imagine the dinner parties they had on this wide expanse of patio that goes up to the dock? Walking back towards the main building at the Ringling Museum in Sarasota, Florida, I cross over the bridge and water. 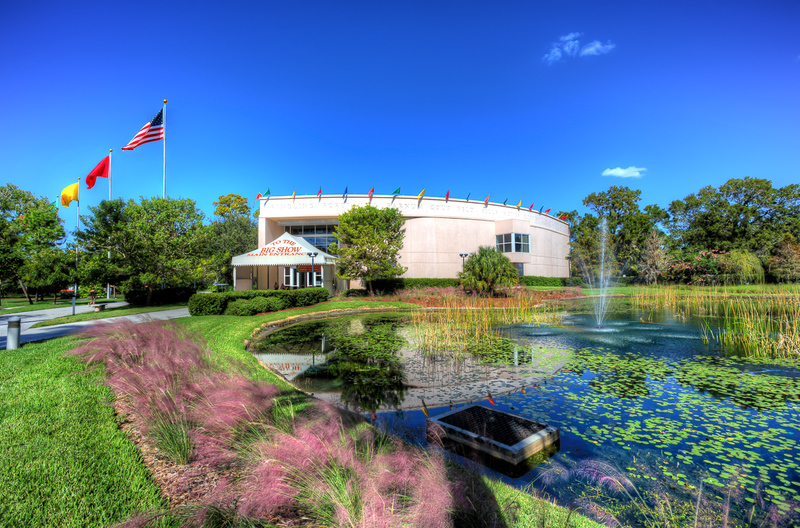 Here you see the building that houses much of the Ringling Circus Historic artifacts. What an interesting place. I wish I had some of those full size circus posters they used to put up on buildings. 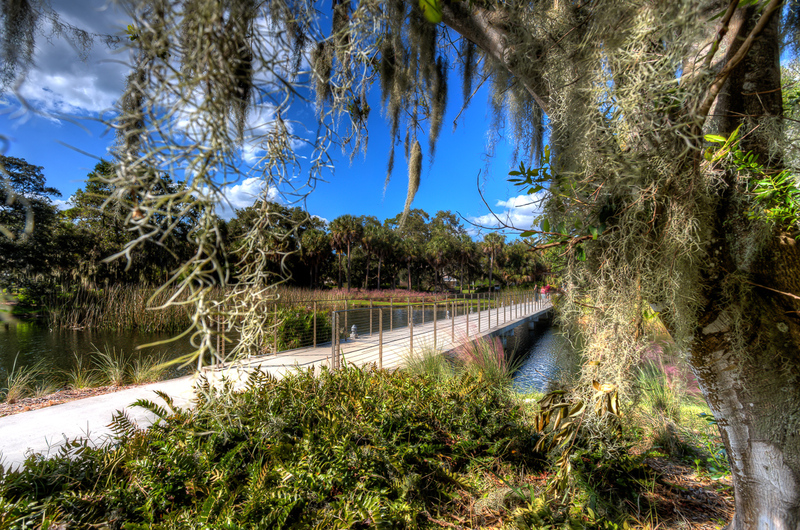 When walking back from the Ringling Art Museum to the Main Building at the Ringling Circus Museum, you walk down this nice pathway that splits a pond. This place is beautiful no matter where you go. After crossing the bridge there is a tiny dark pathway through the woods off to the right. I finally stopped and walked down it and found many hidden treasures including statues tucked away deep in the thick greenery. Is this statue perhaps from a fairy tale or book like Alice in Wonderland? At the wonderful Ringling Museum of Art at the Ringling Museum in Sarasota, Florida I went from one building to another and went through what at first looked like an inside room. 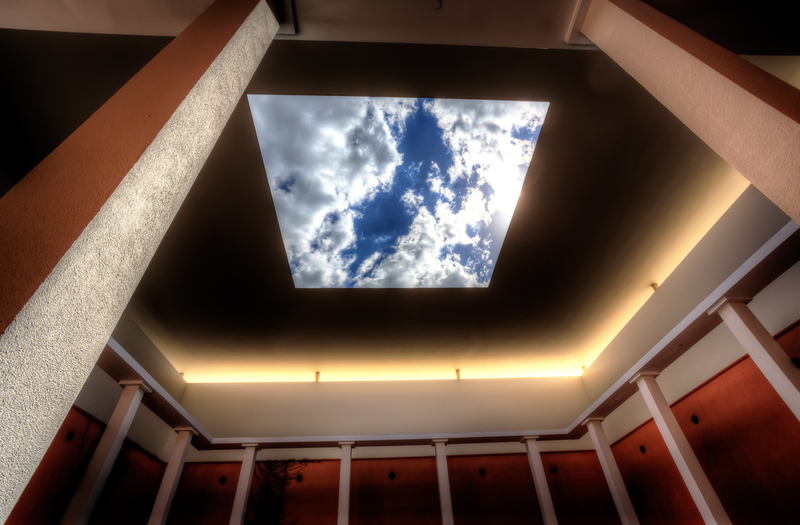 When you looked up, it had a totally open ceiling so actually you were outside. It made a kind of rectangular occulus to the sky. 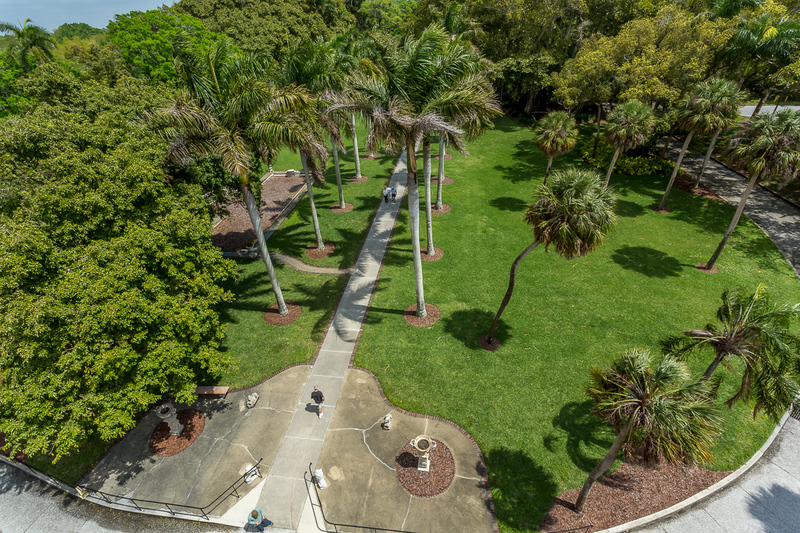 While up on top of the Ringling Mansion on the 5th floor tower, there was a great view of Sarasota Bay, but also a good view of the grounds the other way. Here is a view from on top of the entrance to the mansion showing the row of Royal Palms. Note, this was NOT a Fisheye lens, the road just makes a circular arch. 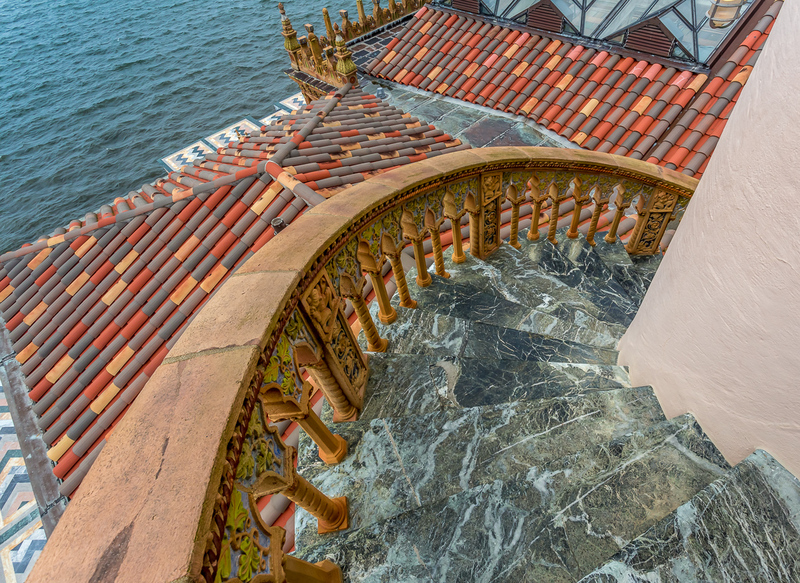 At the very top of the Ringling Mansion in Sarasota, Florida you can take the Private Tour and go up to the fourth floor and even the tower above that to view the entire Sarasota Bay. To get up to the fifth floor you take an outside stone spiral staircase. They only let people go up there if it has not rained in the past 2-4 hours because it could be dangerous. Here is the view down the staircase as we came down. If you take the special tour at the Ringling Mansion at Ca’ d’ Zan they let you go upstairs to the second and third floor and even up on the roof lookout. 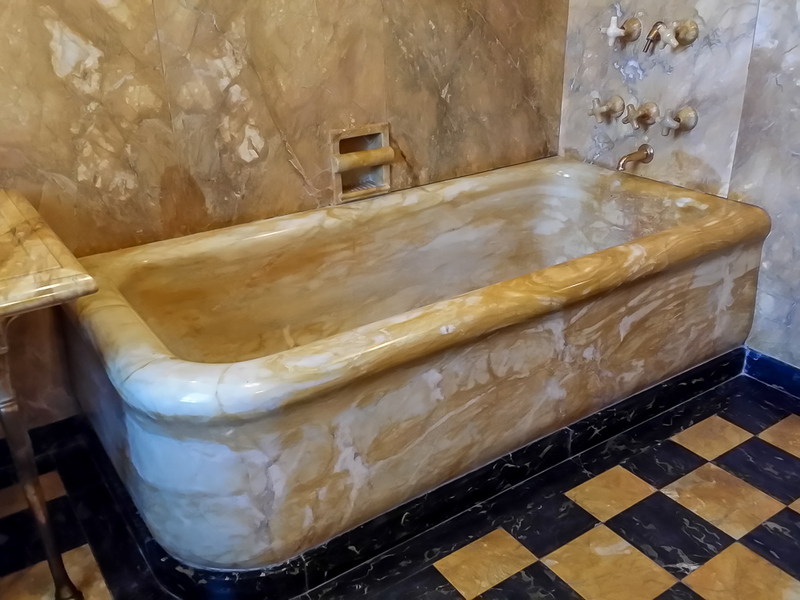 Here in the private bath of John Ringling you can see his bathtub of solid one piece Sienna Marble stone. While the upstairs was under construction, he had guests staying downstairs and some relatives. He took them up to the bath under construction and pointed out the bathtub and said “I will be the only person in the entire USA that can say he has bathed in a solid Marble tub”. A teenage boy relative spoke up that it was not true as he had been sneeking upstairs and using the tub for the past few nights, and he was tossed out of the house by Mr. Ringling. So I left Selby Botanical Gardens finally and while I was in Sarasota, I stopped at the new Ringling Bros Museum. This place is amazing. They have completely redone it in the past 3 years and reopened and I highly recommend you make a trip to see it. 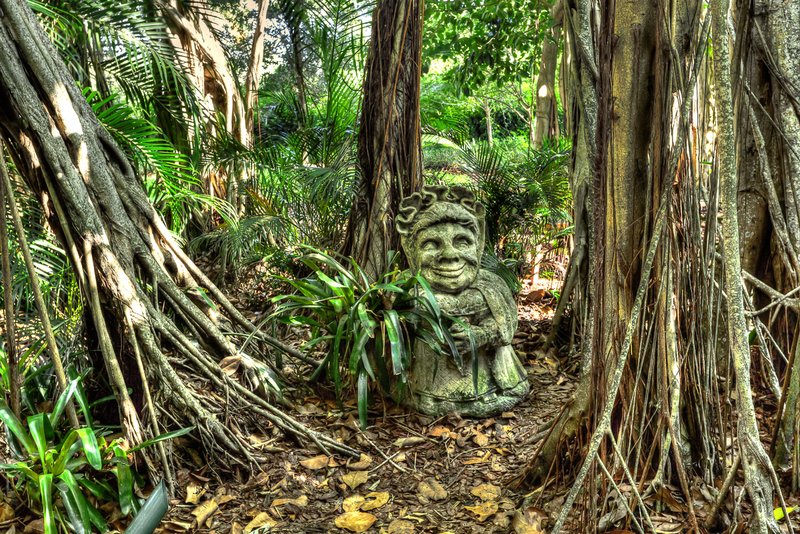 Not only does it have the great John Ringling Mansion Ca’ D’ Zan (house of John), but it has the circus museum, a huge botanical gardens with exotic trees on the grounds, and the wonderful John and Mable Ringling Museum of Art. The Mystery? I was waiting on the main green for my tour of the upper part of the mansion in an hour and noticed something very odd along the main pathway. 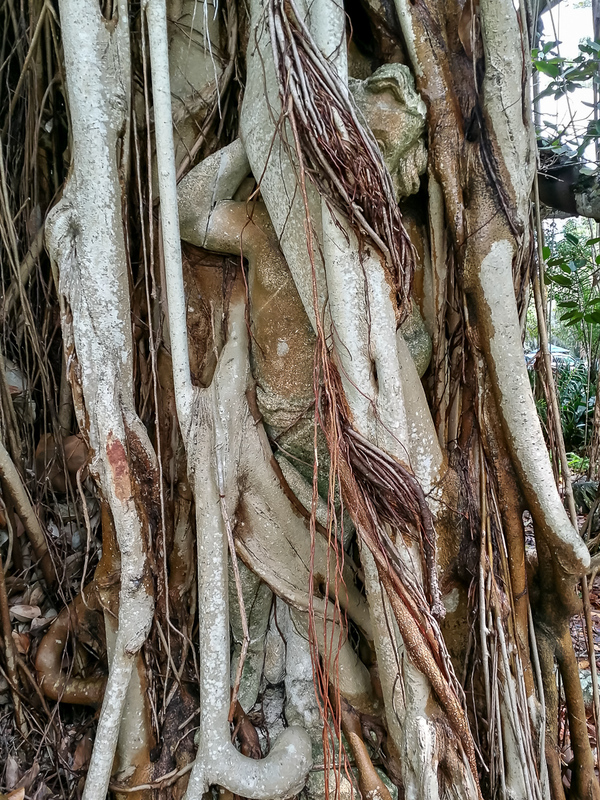 Banyan Trees were growing everywhere and sending their spooky roots down to the ground to make new tree trunks. Here is a photo I took of the strange one. Tell me if you see anything odd or strange. If so, guess what you are seeing and what is going on. I will say that hundreds of people walked by within feet and no one stopped and saw this or commented in any way. I myself have walked by many times and never saw it too until now. There are cut stone statues of cherubs all along the road to the Ringling Mansion. They are in all kinds of poses and occur along the small roadway about every 50-75 feet. 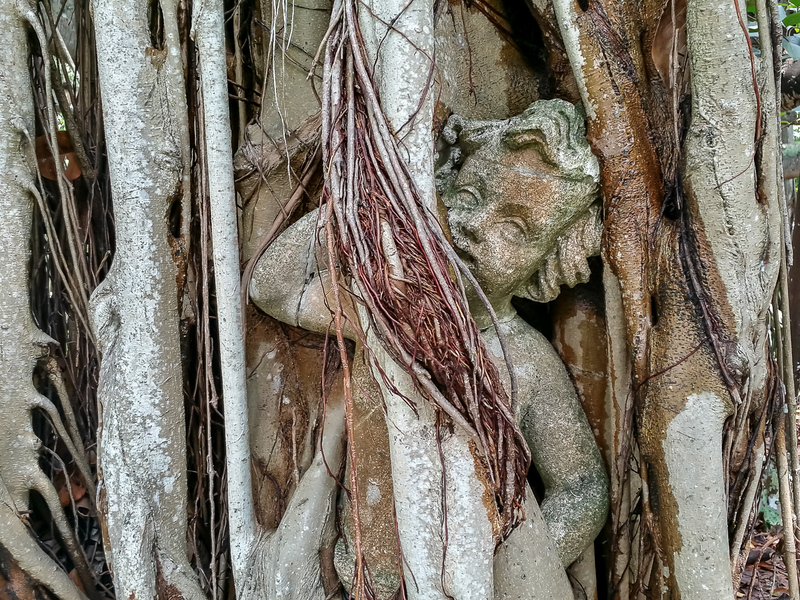 This poor cherub had a Banyan tree grow closer and closer to it and finally send down shoots from above that grew and strangled and trapped the statue into the position it is now. It makes me claustrophobic to see it. If you ever are at the Ringling museum, walk along the right hand blacktop road or driveway to the mansion and on the right side you will see it. The tree and cherub have almost the same color and texture.